It is not an off-roader, that must be made clear so why was it as AL-KO’s Toughest Tow Test? Because Avan, the maker of the Golf brand along with AL-KO, has something to prove. 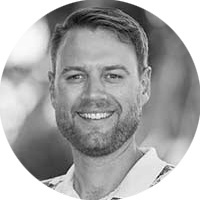 You see, marketers adopt two types of practices in our favourite industry, some claim the world and there are those that err on the side of caution. 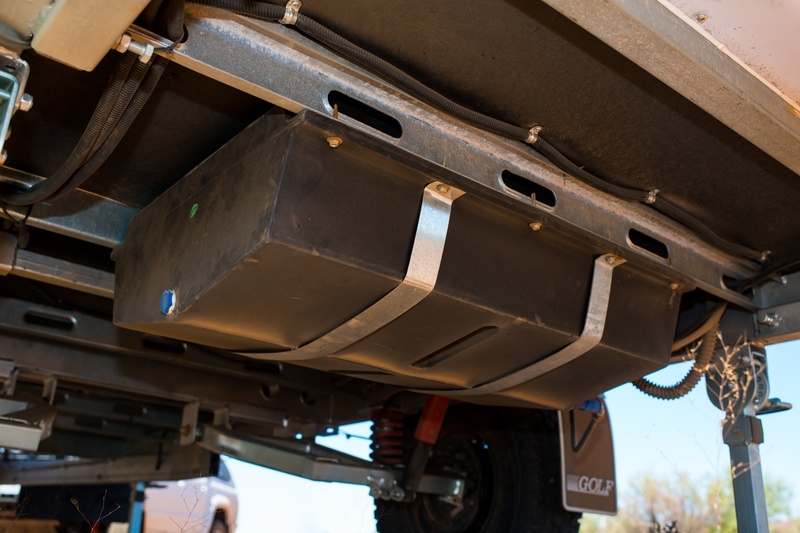 Avan is the latter because it doesn’t take risks (more on that later) but the team needed to know what they do is up for tasks beyond the norm, hence my clenched teeth seeing the little pop-top going places a bonafide off-road camper trailer would question. So what makes it worth pushing so hard? 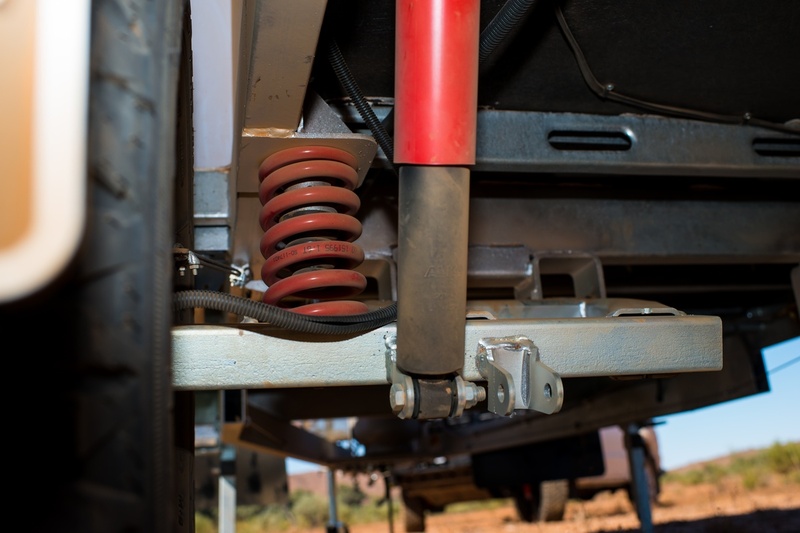 AL-KO’s Enduro Outback independent trailing arm suspension. Yes, the 180mm compression ready, locally welded (not pressed), box section, heavy duty bush and shock-equipped Outback. The same Outback that you see under the big beasts at this years’ Toughest Tow Test. Is it overkill? For ability, you betcha but don’t be fooled into thinking it is too much for the 1300kg Tare van. It really suits it. That’s down to the use of a single axle and to the overall height and width of the body and chassis, which to me at least, felt about perfect for a semi-offroad pop-top. 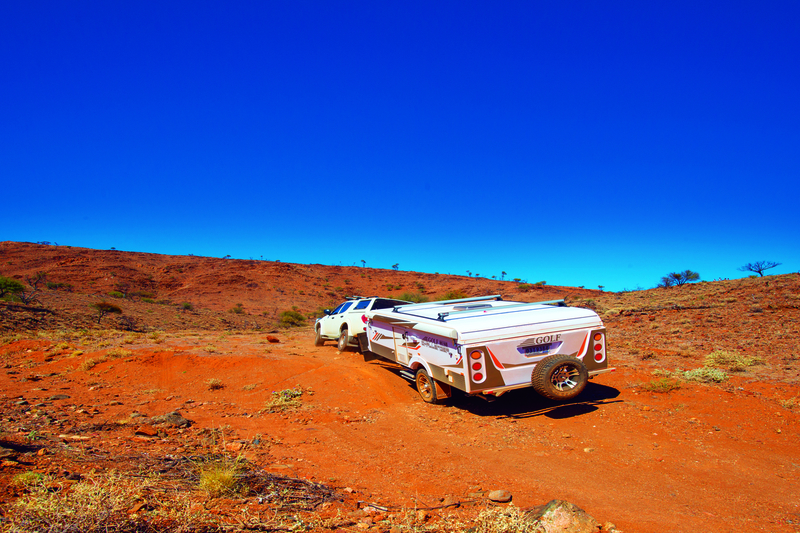 Towed by a moderately capable ute in the Mitsubishi Triton, it sat flat under tow, articulated exceptionally well and moved with the terrain, never really bouncing or appearing unbalanced. 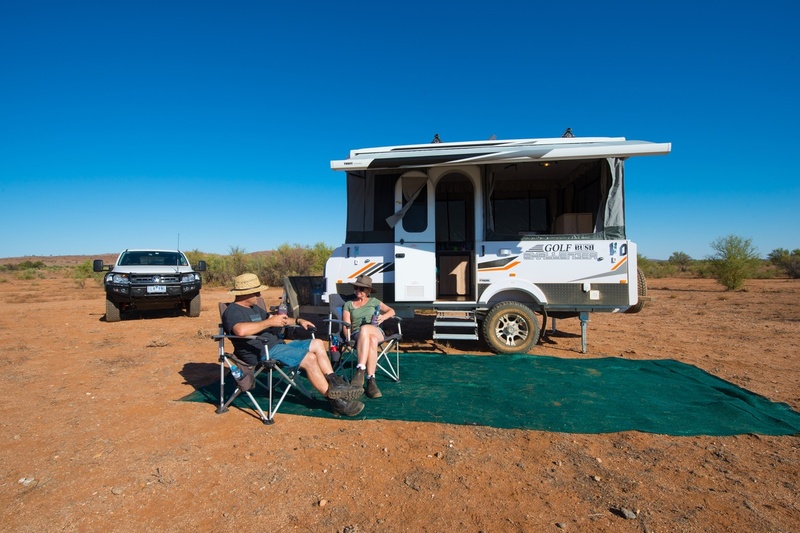 The reason behind the excellent articulation is partly down to the aforementioned dimensions, chassis height, suspension and weight but also down to the new off-road pin coupling recently released by AL-KO. At this years Toughest Tow Tet, the coupling was under the microscope too, this being our first chance to see how it fared in extreme terrain. It did well across the board and if you want to know more, fellow torture-tester Peter has a decent break out on the what sets it apart from the competition – you can read that article here. Stopping for a minute to take it all in, we threw the roof up to get some shade and by threw, I mean we got it up in the time it takes to pick up a rock and throw it. Four clips and a short moment pressing the optional front bin mounted button and the roof is up. 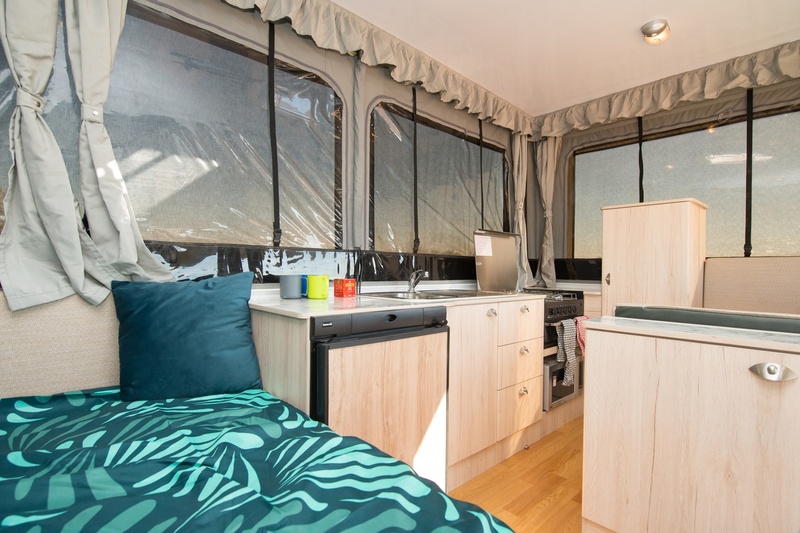 It goes up quick and with decent canvas and zipped windows all round and good curtains, total privacy is close at hand too. An east-west double is the main sleeping spot with overflow capacity found under the neat dinette. The secondary spot is a cosy – perfect for small children. 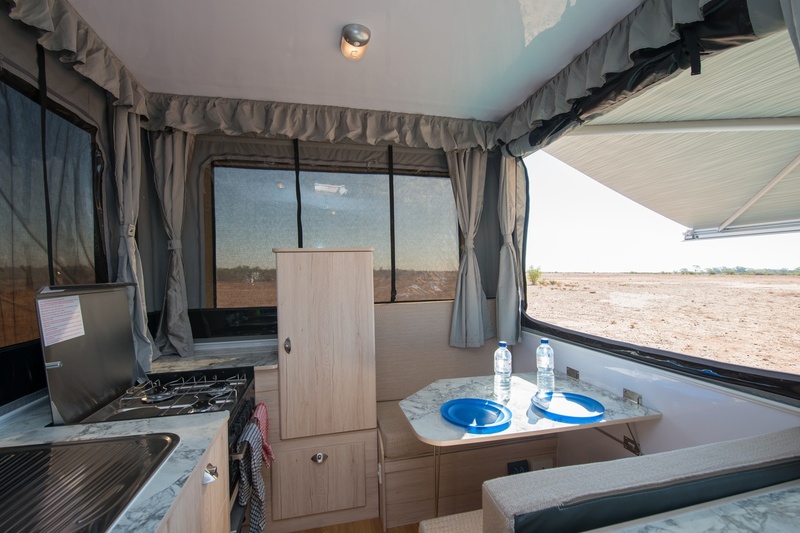 The kitchen is well appointed, a swift four-burner stove top, like you will find in many six-berth vans, sits beside a good sized sink with mixer above. A Thetford 80L, three-way fridge resides under the bench beside a good amount of storage. You could host a decent party with the setup and with all the windows up, feed the hordes from any angle, handy. With the heat of the day passing, I took a minute to crawl under the Bush Challenger as after all, if it is to go bush, it needs to be protected where it matters. The first thing I noticed was the massive, proportionally speaking, water tank. For such a small chassis, the 80L tank looks enormous. Some will suggest it needs a bash plate, I do not. Getting stones and other debris stuck between the bash plate and tank can lead to leaks caused by constant rubbing while driving. I prefer PVC tanks like the Bush Challenger uses as they are tough, real tough. Looking at more detail it was nice to see cables and plumbing tucked away and channelled through cross members in the chassis as it was all terrain tyres and 10″ electric drum brakes. The chassis itself is lightweight, only a 4″ but it doesn’t need more (recall the 1300kg Tare). Up front is a decent sized bin and stoneguard protecting a 9kg gas bottle and with the roof down two more options are evident, a Rola roof rack and an 80W solar panel feeding down to the battery. 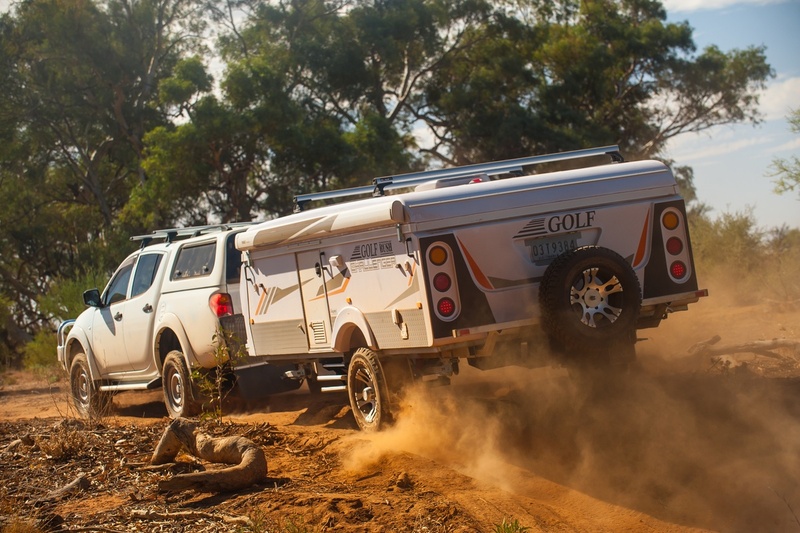 The Golf Bush Challenger is more capable than Avan’s marketers suggest. Should you want a capable pop-top on a budget, I haven’t met better. It has almost enough to take you off grid for extended periods and it does it with little effort, sometimes less is more.